Diabetes is a serious condition that can cause a range of other health problems including nerve damage and neuropathy. According to government statistics, nearly ten percent of the population has diabetes. Even worse is that thirty percent of adults have pre-diabetes, which is a condition that often leads to diabetes itself. This is a frightening prospect and truly shows how obesity, poor diets, and fats and sugars have led us to this point. How Does Yoga Help People with Neuropathy and Nerve Damage? What Yoga Poses Can Help? The good news is that even if you suffer from diabetes, exercise can help. 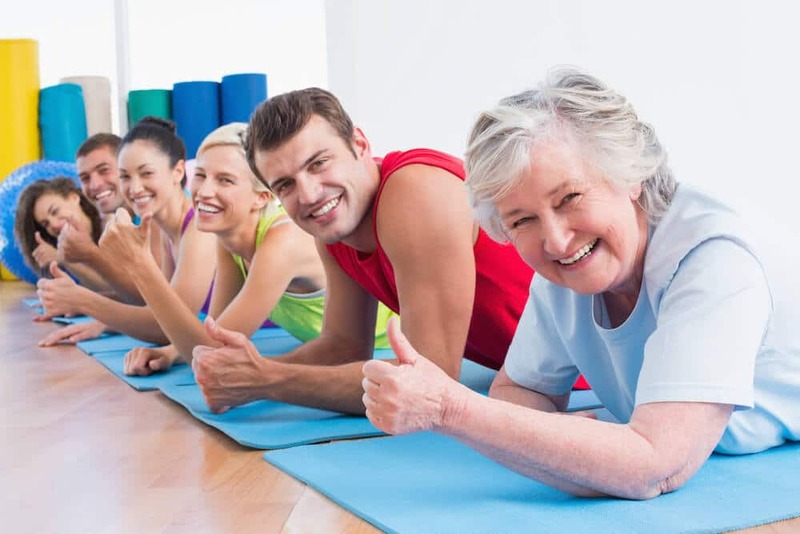 According to the Journal of Diabetes Complications, exercise can help those suffering with peripheral neuropathy. Yoga, in particular, has been shown to help people with this condition and many people around the country find that they maintain long-term benefits from engaging in it. Yoga is much more than an approach to physical exercise. It is a holistic approach to living that incorporates an ancient philosophy of mind and body. It recognizes the direct link between the mind and the body and uses specific exercises to strengthen this link. As the body becomes stronger and more flexible, the mind also becomes stronger and more flexible. Stress: Stress is a real killer. In fact, our modern world is filled with triggers and stressors that affect us without us even realizing it. For those with existing health conditions, these stresses only serve to exacerbate their conditions. Yoga can help to create a sense of inner peace and mindfulness. Circulation: Good blood flow is important to people who suffer from conditions such as peripheral neuropathy. Many yoga poses will help to improve blood flow in these areas of the body. Cortisol is a chemical messenger that places our bodies into a stressful fight-or-flight mode. Yoga can reduce the level of cortisol in our bodies and help to reduce the amount of stress that we feel. Awareness: The regular practice of yoga at any level can help to increase our sense of awareness. It helps us to develop a sense of mindfulness and enjoyment of the moment and also helps us to reduce the pain and discomfort that we feel from conditions such as neuropathy. This is the classic yoga triangle pose. Even if you haven’t quite developed your flexibility, this one is not too difficult for beginners. To do a Trikonasana pose, stand straight up with your feet together. Then bend down and try to touch your toes. If you can’t do this, it’s okay. Just stretch as much as you can and maintain the triangular body shape that gives this yoga pose its name. If you can maintain the Trikonasana pose for at least six full seconds, you’re doing really well. Just make sure that you do your best not to bend your knees as you do it. And just remember that even if you can’t quite touch your toes, the important thing is to stretch down as far as you can, keep your knees unbent, and maintain the pose for at least six seconds. Once you’ve been in this position for six seconds, you can slowly come back up. Always remember to exhale your breath as you go down into the pose and inhale when you’re coming back up. Doing this will help to maintain the energy in your muscles and around your body. This pose is one of many that will help to improve blood flow in the extremities where neuropathy is most often felt. It will also help to strengthen the nerves as the flow of energy brings about an awareness of your body. 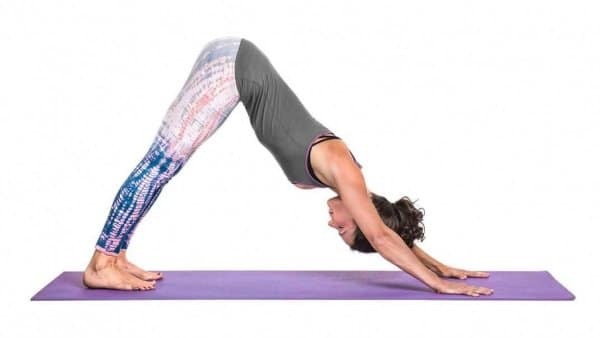 Many people call this one the “camel pose” and you may know it by this name. As with the trikonasana pose, it is ideal for improving all important blood flow to areas of the body where nerve damage is most often felt. You’ll need a little more flexibility for this yoga pose but it’s important to remember that your progression in yoga is to be done at your own pace. Everyone is different and everyone can benefit from even beginning yoga poses. 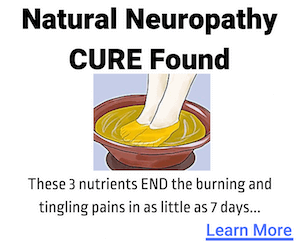 This is especially the case for people with diabetes wanting to help with nerve damage problems. In Ustrasana, start in a kneeling position. Extend both arms behind you and rest your palms flat on the ground. Once you’re in this position, gently lift your hips and pelvic region upwards. Once you’re doing this, you can tilt your head backwards. Always remember to inhale as you’re doing this. Hold the Ustrasana pose for at least three full seconds and then slowly return back to the original kneeling position whilst exhaling your breath. While it’s not as beginner-friendly as some exercises, it’s a great way to improve blood flow throughout the pelvic region. Yoga often uses other descriptors for poses that might sound intimidating. We’ve looked at the “camel pose” so now it’s time to look at the “chair pose”. Most importantly, utkatasana is fantastic exercise for strengthening nerves. For those with neuropathy and damaged nerves, being able to achieve the utkatasana pose regularly can really help them to overcome the pain and discomfort of their conditions. Most people can do this one even if they haven’t quite achieved maximum flexibility. Start by standing straight up with your feet pointed straight and your hands outstretched in front. Squat down slowly as low as you can go as you remember to exhale. Hold the chair position for three full seconds if you can and then rise back to your original standing position. Remember to inhale as you return to your standing position to gain maximum benefit. There are lots of poses in yoga that will suit people of all types and skill levels. An inversion pose is any pose where the body is inverted. This means things such as bending forwards, standing on the head, standing on shoulders, and the so-called “downward-facing dog”. One of the biggest issues that people with neuropathy have is the tingling and discomfort that they feel in their hands and feet. This is because the nerves are being damaged because of their illnesses. One simple yoga exercise can help with these issues each and every day. Start by sitting with your legs crossed as in the classic lotus position. Then, place each of your fingers between your toes so that they are all intertwined. Once you’ve done this, you can start by spreading your fingers as wide as they will go. This exercise will not only help your fingers but will also stretch out your toes. 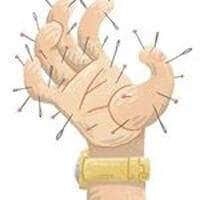 Doing this will improve blood flow in these peripheral parts of the body and will also strengthen the nerves. 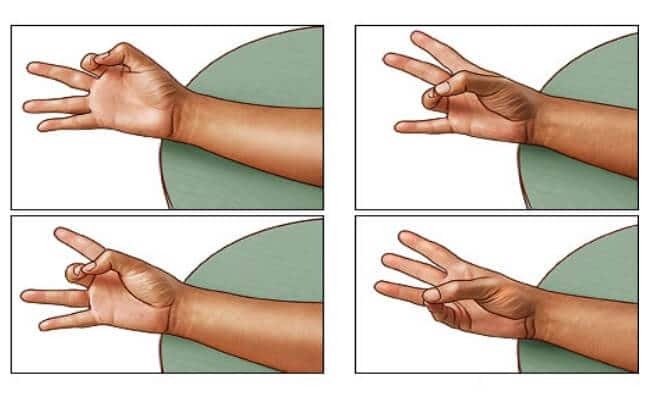 If you can do this for at least a few minutes each day, you’ll find that any sensations of tingling in your hands and feet start to improve. Once again, this is one of the simpler yoga poses that is aimed squarely at beginners to this holistic discipline. The real benefit of this is that it can help to strengthen some of the parts of the body that suffer from nerve damage and neuropathy. First of all, you’ll need to lie on your back. Once you’ve adjusted to this position, it’s time to slowly bring up your right knee to your chest as far as you can. Use your arms to hold the shin and to stretch the leg as far as you can to your chest. When your leg is as far as it can go, carefully try to touch your knee with your head. Always remember to exhale as you are doing this part of the exercise. You can hold this pose for a few seconds and then repeat it with the other leg, doing exactly the same thing. Try and do this at least four times if you can, always exhaling as you bring up your legs and inhaling as you place them down again. Yoga is a great way to not only stay fit and healthy, but it can also help improve blood flow to your hands and feet which may help relieve neuropathy symptoms. However, yoga alone is not enough to be free from the pain and tingling. It's also recommended to take herbs and vitamin supplements to provide your body with the proper nutrition required for healthy nerve function.